On the heels of receiving the 2017 Diagnostic Virology Award, an international career achievement award, Dr. Kirsten St. George, Chief of the Laboratory of Viral Diseases, was presented with the Alumni Award from the University of South Australia (UniSA) in Adelaide. Dr. St. George receiving the Alumni Award from UniSA Vice Chancellor Professor David Lloyd. Image: University of South Australia, photo by Aise Dillon. During the ceremony, Vice Chancellor Professor David Lloyd commented on the significant contributions of the awardees. Dr. St. George’s more than 35-year career has profoundly impacted diagnostic virology, spanning the globe from Adelaide, where she grew up and earned a bachelor and master’s degree in medical laboratory science, to Albany, and back to Adelaide in October 2018, for this prestigious award. Beginning with basic research in South Australia in the 1980s, she transitioned to the clinical arena, establishing the first centralized virology diagnostic laboratory in Hobart and the first state HIV reference laboratory in Tasmania. In the early 1990s she moved to Pittsburgh, where her work at the University of Pittsburgh Medical Center included the development and trial of sensitive methods for the early detection of viral infections in transplant recipients. These tests facilitated preemptive therapy regimens with a dramatic reduction of fatality rates in high-risk patients. She also earned a Ph.D. from the University of Pittsburgh, with research focused on the evolution of antiviral resistant viruses in transplant recipients. Dr. St. George, holding the crystal bowl, a gift from the university, is pictured with Professor Anthony Woods. She was a student in his first class. He went on to become associate head of the school and recently retired. Image: University of South Australia, photo by Aise Dillon. Dr. St. George moved to Albany and joined the Wadsworth Center in 2004. Her group performs diagnostic reference and surveillance testing and applied research, has regulatory oversight of test methods for NYS-permitted clinical virology laboratories, and collaborates with several basic research scientists. Over the years, they have worked with many viruses, including several headliners. During 2015-2016, they tested more than 12,000 suspected Zika cases, confirming over 1,200 positive patients. The laboratory has also evaluated numerous automated platforms, chemistries and testing systems for accuracy and reliability, as well as developed countless molecular techniques, utilizing real-time polymerase chain reaction (PCR) chemistry, micro-arrays, and various sequencing methods for a wide variety of applications. They are increasingly using next generation sequencing for the characterization of viruses and the investigation of viral evolution and molecular epidemiology. The Virology Laboratory that Dr. St. George directs also holds federal surveillance contracts, providing major public health support to the CDC in several areas. As one of three National Influenza Reference Centers, it characterizes influenza samples from 22 US states. Similarly, it is one of four National Reference Centers for vaccine preventable diseases, one of five for Norovirus surveillance, and is the sole support laboratory to the CDC for antiviral resistance testing for influenza. Dr. St. George has also played a key role in the writing of numerous virology practice guidance documents and led the laboratory response efforts to countless complicated case investigations and major viral disease outbreaks. She also serves on several federal advisory boards and committees. She has always enjoyed mentoring students and in the last 14 years, guiding the younger scientists in her laboratory and building the virology team at Wadsworth. She is proud of the important contributions to science and public health made by her team. James Tan, Kirsten St. George, Vice Chancellor Professor David Lloyd, Amanda Vanstone, James Charles. Image: University of South Australia, photo by Aise Dillon. 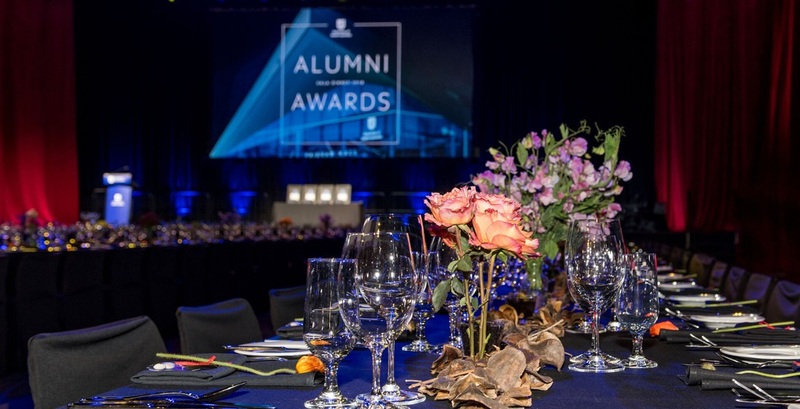 The most recent Alumni Award winners have made contributions in diverse fields. James Tan co-founded an e-commerce company listed on Nasdaq and founded a leading commercial venture fund. Amanda Vanstone, former Senator, Minister and Ambassador to Italy, is now a successful commentator in radio, television and print media. James Charles dropped out of school at 14, but went on to earn a Ph.D. and become Professor of Podiatry contributing groundbreaking research. Congratulating the 2018 winners, UniSA Vice Chancellor Professor David Lloyd commented, “I see … a spirit of enterprise – hard work, curiosity, self-belief, dedication to service and action, and an ambition to be the best they can be … gratitude for the opportunities presented to them and a passion to contribute to society".